Camille Pissarro (1830–1903), Morning Sunlight on the Snow, Eragny-sur-Epte (1895), oil on canvas, 82.3 x 61.6 cm, Museum of Fine Arts, Boston, MA. Wikimedia Commons. The great majority of paintings of trees show them in leaf, from the brilliant pale green of spring to the burning golds and browns of autumn. But there is a long history of occasional landscapes painted with trees bare, and snow on the ground. This seasonal celebration of the effects of snow and winter aims to show some of the better works of this kind. It is not the first: in 1998, there was an exhibition at The Phillips Collection, Washington, (later appearing at the Fine Arts Museums of San Francisco and the Brooklyn Museum of Art) which focussed on Impressionist paintings of effets de neige (effects of snow) in the works of Monet, Renoir, Pissarro, Sisley, Caillebotte, and Gauguin. Its catalogue (see below) is still available on the secondhand market, and is a thorough account of its unusual subject. I have tried to cast my net a little wider, though, whilst narrowing the landscapes to those in which trees are a significant feature. I have provided links to more detailed accounts of each artist where possible. Pieter Brueghel the Elder (1526/1530–1569), Hunters in the Snow (Winter) (1565), oil on wood, 117 x 162 cm, Kunsthistorisches Museum, Vienna. Wikimedia Commons. Pieter Brueghel the Elder (1526/1530–1569) was not only one of the founding fathers of landscape painting, but a particular exponent of winter scenes, often populated with country people. 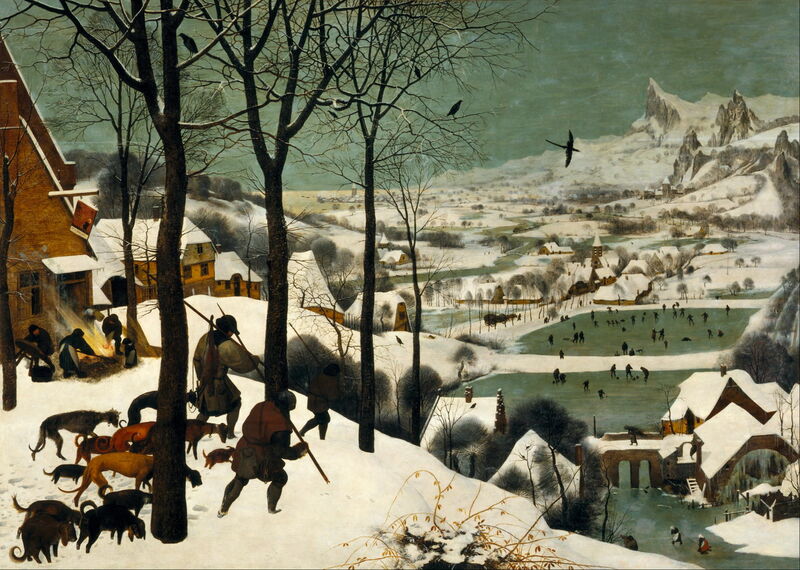 His Hunters in the Snow (Winter) (1565) brings together many of these elements, and is one of his best-known works. It is unusual for his innovative treatment of the dense branches and twigs in trees, which has seldom been copied by others, but which appears very effective. 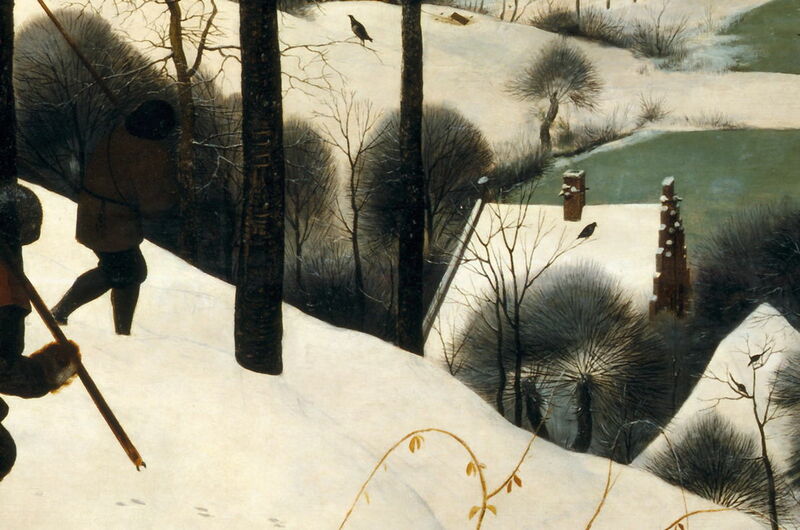 Pieter Brueghel the Elder (1526/1530–1569), Hunters in the Snow (Winter) (detail) (1565), oil on wood, 117 x 162 cm, Kunsthistorisches Museum, Vienna. Wikimedia Commons. 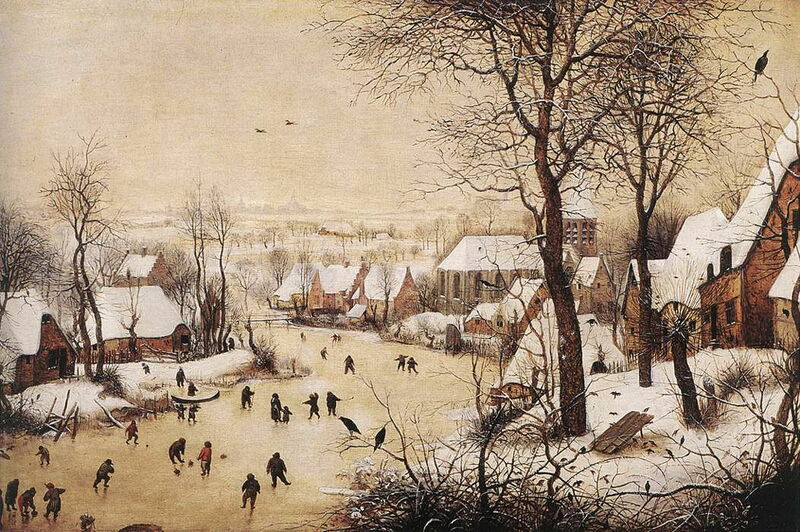 Painted at about the same time, possibly during the same winter, his Winter Landscape with Skaters and Bird Trap (1565) is more typical of his home country, the Netherlands. The bare branches of trees, even in the distance, are here painted more conventionally than in his Hunters in the Snow (Winter). 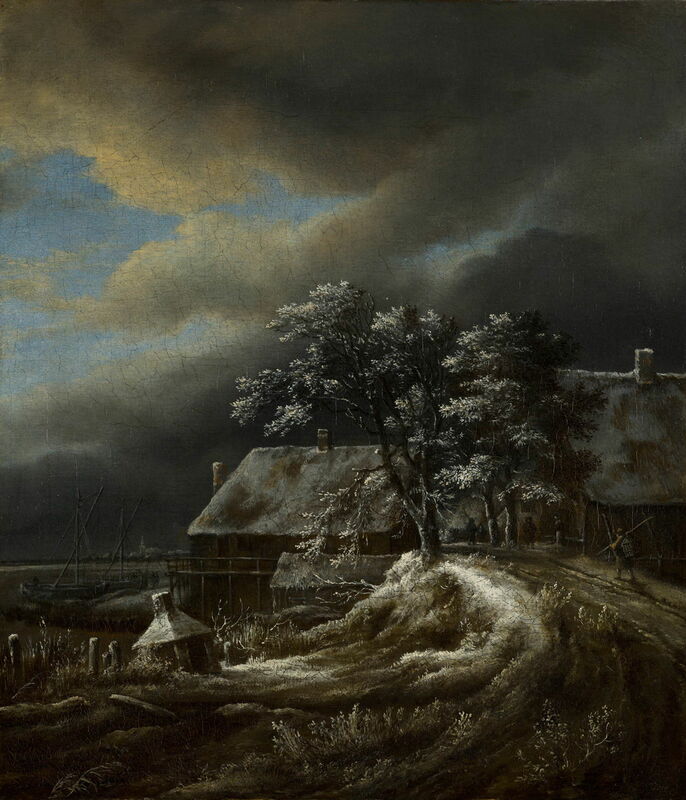 Jacob Isaakszoon van Ruisdael (1628/9–1682), Winter Landscape (c 1660-70), oil on canvas, 37.3 x 32.5 cm, Royal Picture Gallery Mauritshuis, Amsterdam. Wikimedia Commons. Jacob van Ruisdael (1628/9–1682) painted several snowy landscapes, including two very similar versions of Winter Landscape (c 1660-70). This is the Mauritshuis version, which is perhaps slightly preferable to that in Birmingham, Alabama, although both show similar finely detailed snow or heavy frost on the trees. Gustave Courbet (1819–1877), Effet de neige (Effect of Snow) (1866-8), oil on canvas, 72 × 92 cm, Private collection. Wikimedia Commons. There appear to have been few memorable attempts to show trees in snowy landscapes after van Ruisdael, until Gustave Courbet (1819–1877) revived them in his later works. His Effet de neige (Effect of Snow) (1866-8) is one of a series, others showing wild animals and hunting in the snow. 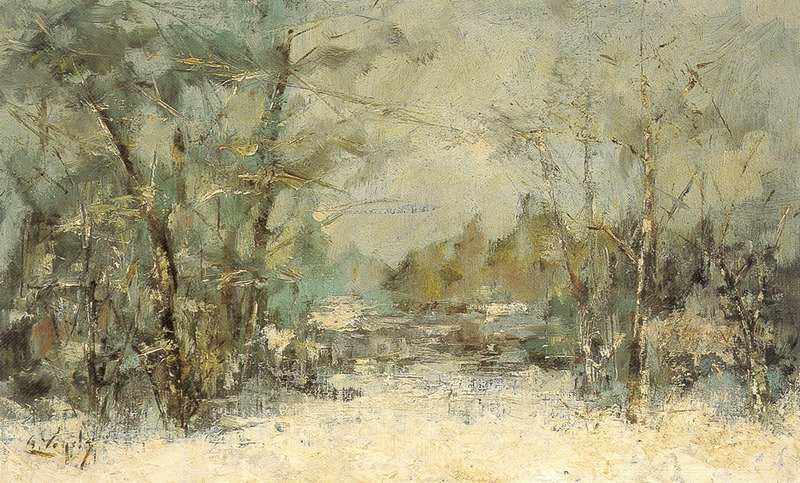 His very loose brushwork captures the texture of the snow on a country road near his home town of Ornans. 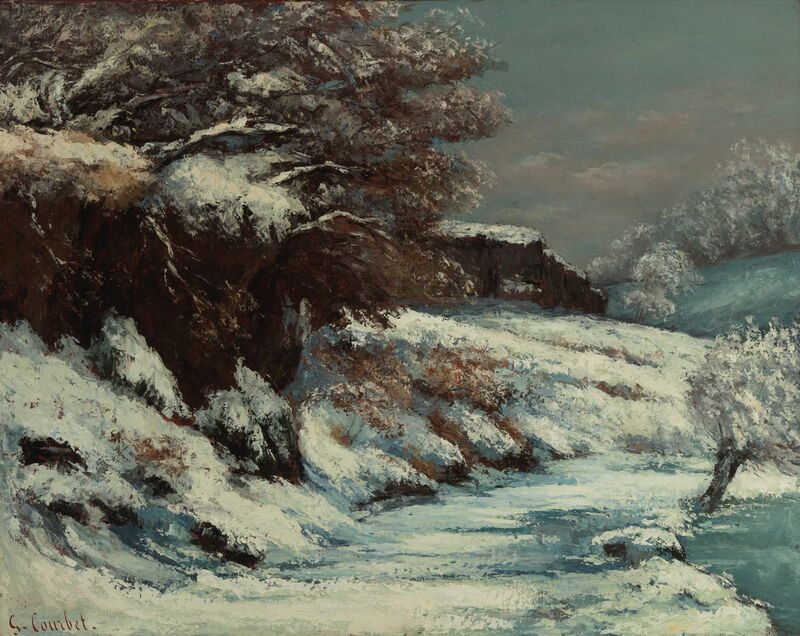 Courbet’s landscapes were particularly influential on the development of Impressionism, which brought the revival of paintings of winter scenes. The early years of the Impressionist movement were accompanied by a succession of cold and very snowy winters in Paris and its environs: in 1869/70, 1870/1, and 1879/80 in particular. 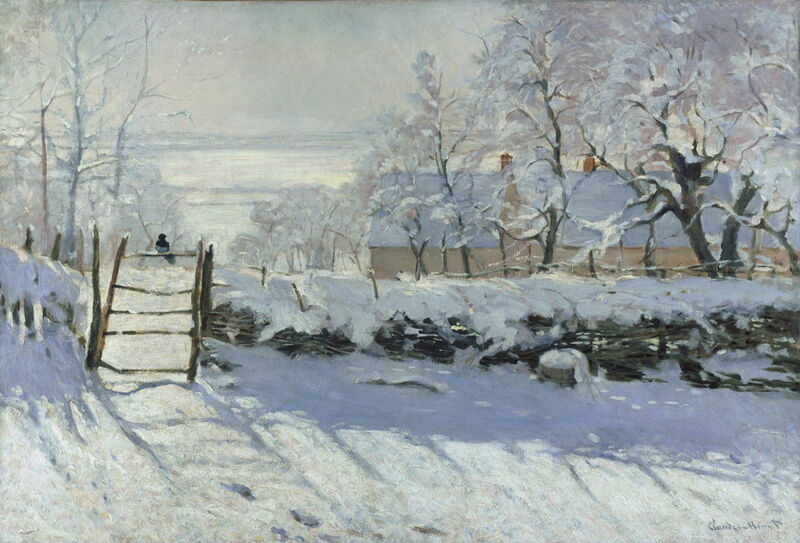 Monet, Renoir, and Pissarro painted many snow scenes, including one of Claude Monet‘s (1840-1926) most famous works (still among the most popular images in the Musée d’Orsay), The Magpie (1868-9). 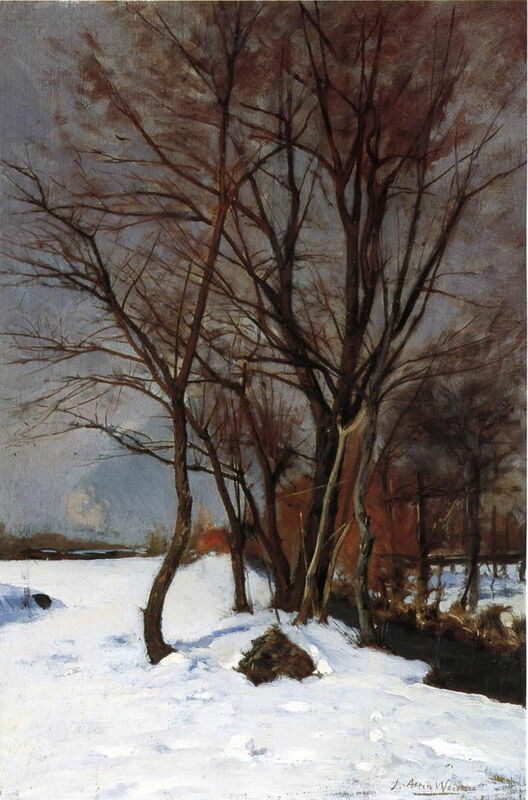 All three Impressionists constructed bare trees in similar style, the snow and dark bark making sinuous forms. Camille Pissarro (1830–1903) painted a succession of views of the roads around Louveciennes, where he was living. 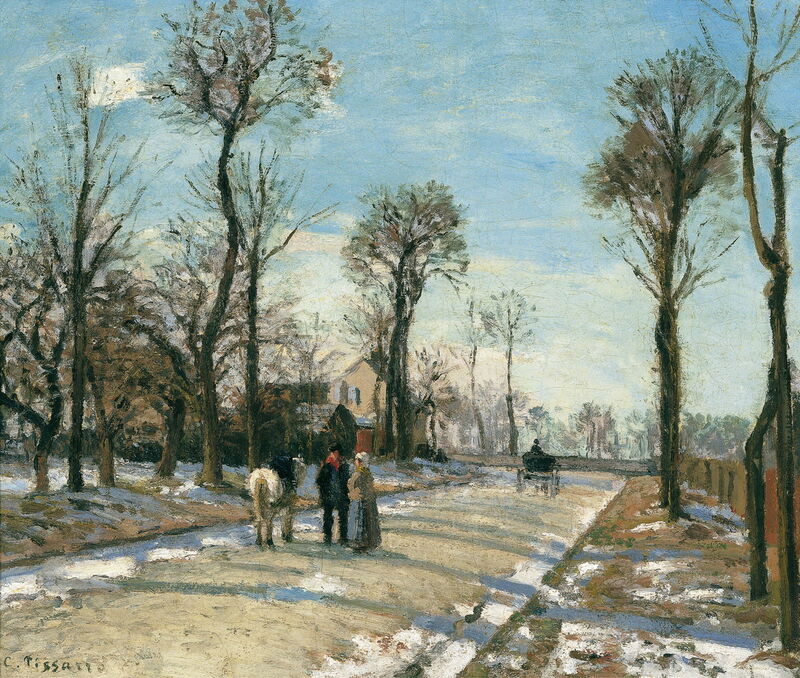 His Road to Versailles at Louveciennes (Snow Effect) (1869) is typical of his earlier ‘road’ paintings, showing an avenue of tall, bare-branched trees, brushed in coarsely. The following year his rushed and more sketchy trees resolved into finer and more subtle representations, as he started to use brighter colours too, shown in his Route de Versailles, Louveciennes, Winter Sun and Snow (c 1870). Alfred Sisley (1839–1899), Snow on the Road, Louveciennes (1874), 38 × 56 cm, Private collection. Wikimedia Commons. 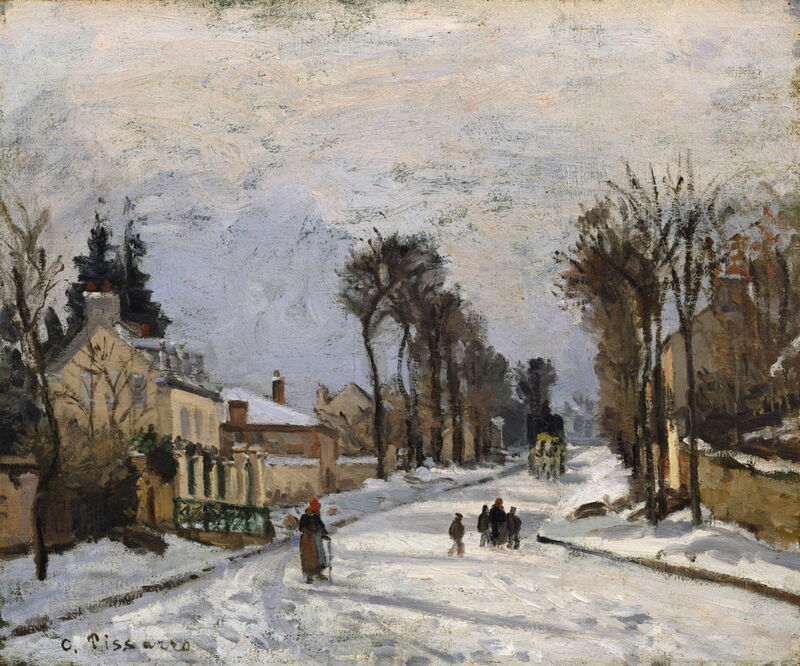 Alfred Sisley (1839–1899) was not as prolific as Pissarro in either ‘road’ or snow scenes. 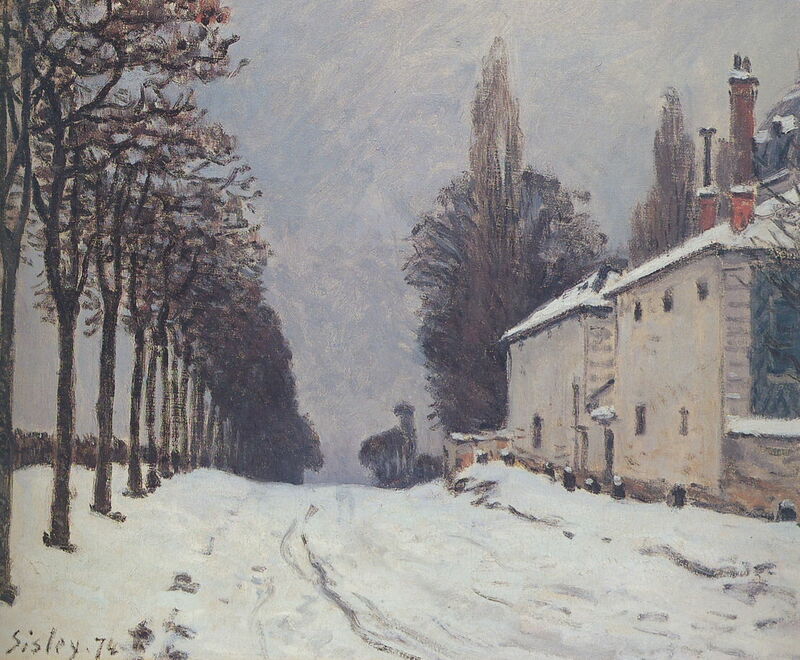 His Snow on the Road, Louveciennes (1874) clearly comes from the same school, but his trees and buildings remain distinctive. Camille Pissarro (1830–1903), Effect of Snow at L’Hermitage, Pontoise (1875), oil on canvas, 54 × 65 cm, Private collection. Wikimedia Commons. Pissarro’s Effect of Snow at L’Hermitage, Pontoise (1875) strikes a better balance between an impression captured in great haste, and sufficient detail in the foreground tree to give it fuller form and real character. Julian Alden Weir (1852-1919), Winter Landscape with Stream (c 1888), oil on canvas, 39.4 x 25 cm, Private collection. WikiArt. As I have shown in my series on impressionist painting beyond the French Impressionists, there were many others around the world who developed their own peri-impressionist styles. Julian Alden Weir (1852-1919), in the USA, expressed his own vision in works such as his Winter Landscape with Stream (c 1888). Guillaume Vogels (1836-1896), Coucher de soleil sur la neige (Sunset on the Snow) (c 1890), oil on canvas, 55 x 83 cm, Maison des Arts, Schaerbeek. Wikimedia Commons. 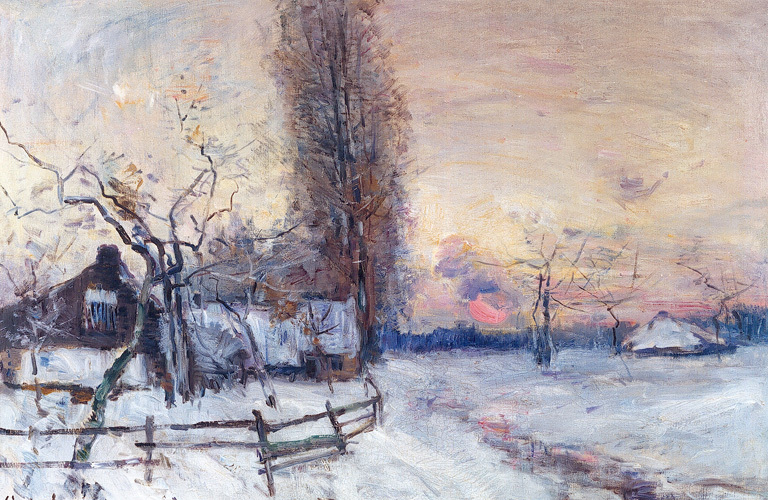 Another of the peri-impressionists, Guillaume Vogels (1836-1896), a Belgian, painted Coucher de soleil sur la neige (Sunset on the Snow) in about 1890. Alfred Sisley (1839–1899), The Canal du Loing at Moret (1892), oil on canvas, 73 x 93 cm, Musée d’Orsay, Paris. Wikimedia Commons. 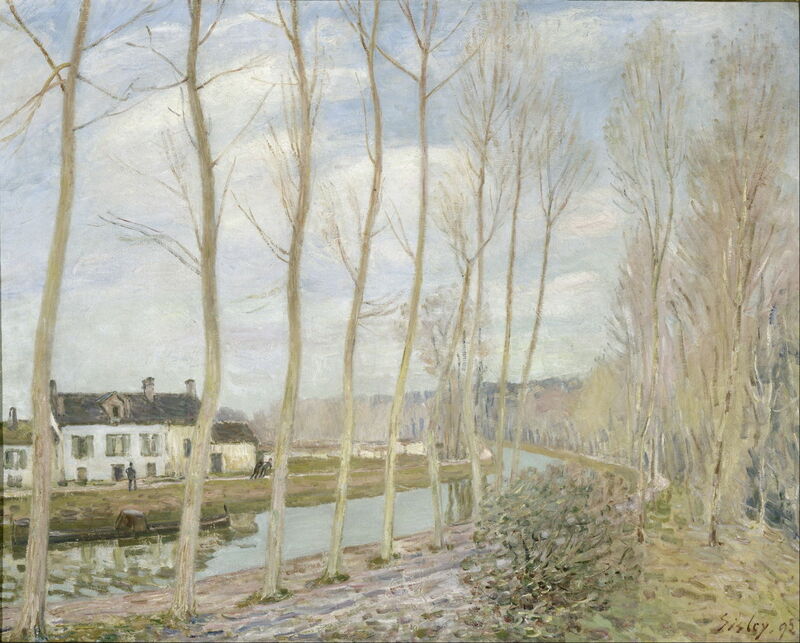 Although it does not quite contain snow, Sisley’s late painting The Canal du Loing at Moret (1892) is thoroughly wintry; there had been little snow near Paris that year. George Inness (1825-94), Home at Montclair (1892), oil on canvas, 76.5 x 114.3 cm, Sterling and Francine Clark Art Institute, Williamstown, MA. Wikimedia Commons. George Inness (1825-94) was another great and innovative American landscape painter of the period. 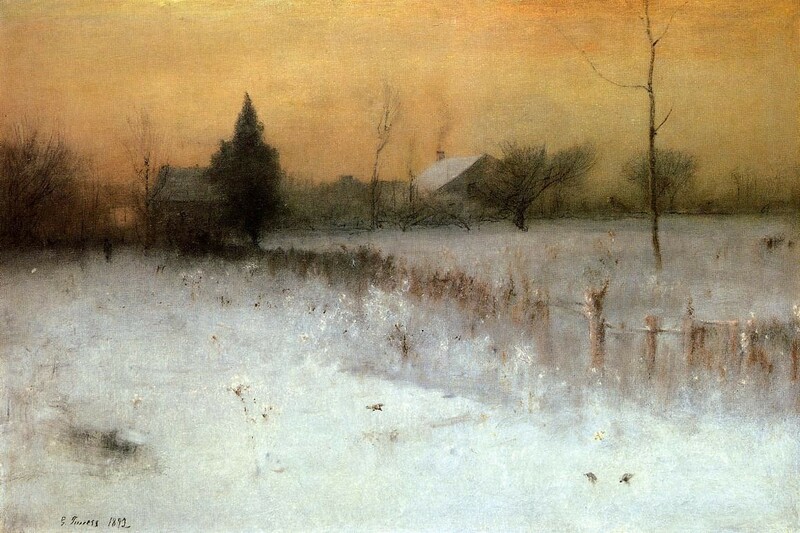 His Home at Montclair (1892) is one the bleakest paintings of effets de neige, its few straggling trees looking like the sparse survivors from a great storm. Akseli Gallen-Kallela (1865-1931), Imatra in Wintertime (1893), oil on canvas, 28.5 x 34 cm, Malmö Konstmuseum. Wikimedia Commons. Painting near the south-eastern border of his native Finland, Akseli Gallen-Kallela (1865-1931) shows the much deeper winter of the far north in his Imatra in Wintertime (1893). 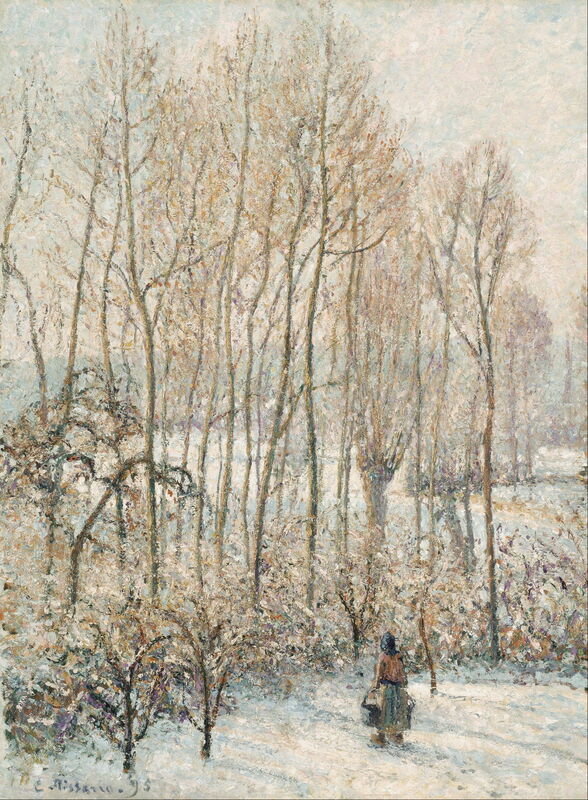 Guillaume Vogels (1836-1896), De vijver in de winter (The Pond in Winter) (1895), oil on canvas, 53 x 71.5 cm, Stedelijke Musea Sint-Niklaas, Sint-Niklaas. Wikimedia Commons. 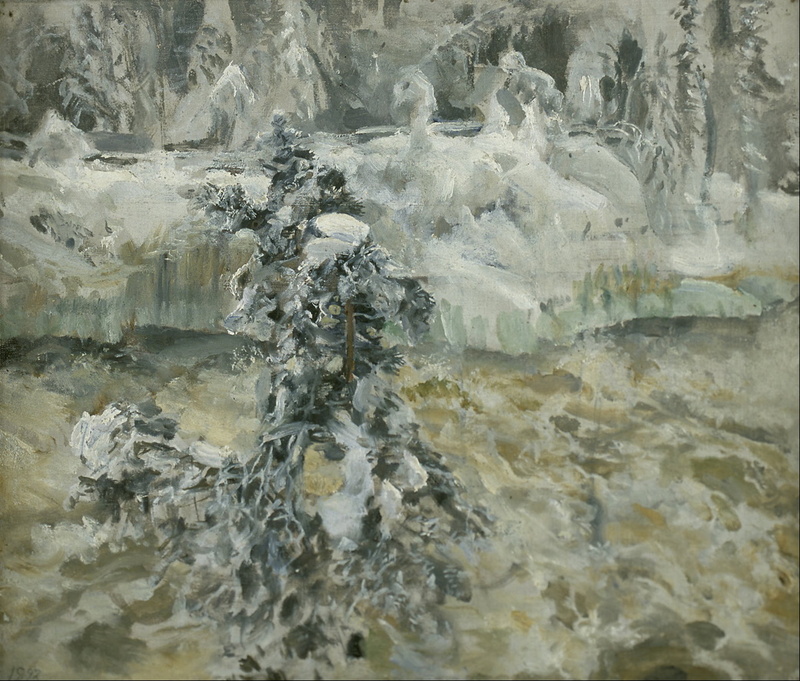 Vogels’ De vijver in de winter (The Pond in Winter) (1895) is another distinctive study of trees in the winter landscape, which seem to have overwhelmed his pond altogether. My last choice, though, must be another work by Pissarro. If any artist seemed to thrive in painting winter, it was he – at least until later life, when eye problems prevented him from painting outdoors when it was cold. 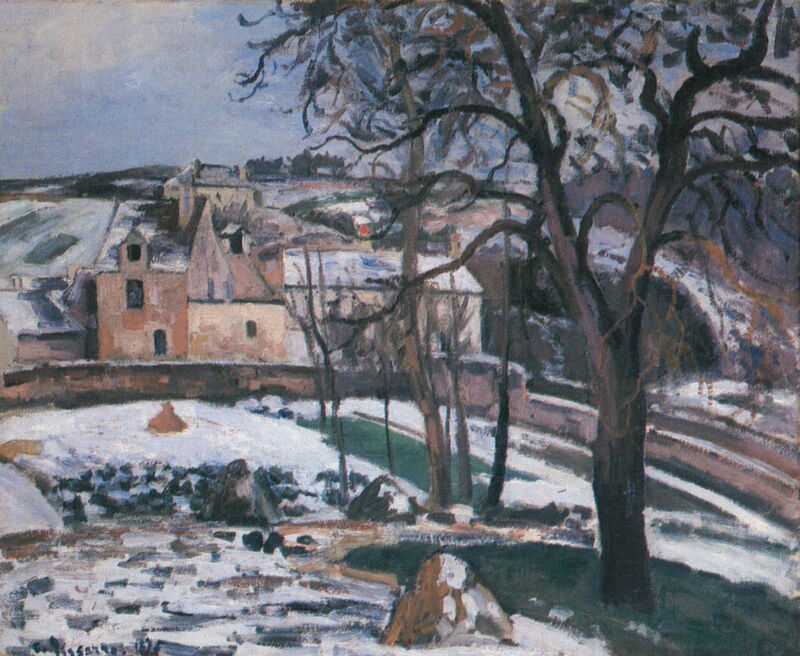 Morning Sunlight on the Snow, Éragny-sur-Epte (1895) shows the intricate detailing which he developed after his years of Divisionism, and is one of the vast series of views that he painted around his home near Éragny. I am just glad that I was not his assistant, nor the lightly-clad woman seen here. Moffett CS, Rathbone EE, Rothkopf K & Isaacson J (1998) Impressionists in Winter: Effets de Neige, Philip Wilson. ISBN 978 0 8566 7495 8. Posted in General, Painting and tagged Brueghel, Courbet, Gallen-Kallela, Inness, landscape, Monet, painting, Pissarro, Sisley, snow, trees, van Ruisdael, Vogels, Weir, winter. Bookmark the permalink. Pieter Brueghel the Younger painted many copies of the ‘Bird Trap’ (of 127 only 45 attributed as signed by Brueghel) but thought you might be interested that one can be seen at Wilton House. Thank you for that information: that is a lot of copies, almost an industry!